One day I realized that my camera was one of my most precious possessions and that I’d be lost without it. I found myself saying “I wish I had my camera!” if I’d left it at home and realized that this was becoming a real passion. I’m currently interested in the joys of macro photography and have a great deal of fun experimenting with my new lens. Photographs are shown more than once if they have been featured multiple times. This photo received an Honorable Mention in the the August 2009 Boston.com RAW monthly photography contest. This also placed in the Top 10 of the Shapes & Patterns Group’s Dome Shapes Challenge! This photo received an Honorable Mention in the November 2009 Boston.com RAW monthly photography contest. Finalist in boston.com’s RAW Photo contest May 2009. 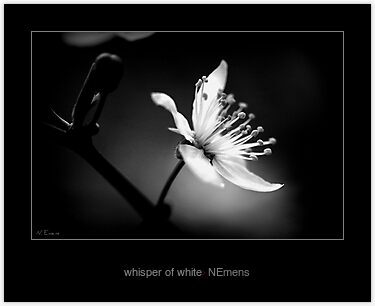 All photographs and artworks in this portfolio are copyrighted and owned by the artist, N. Emens. Any reproduction, modification, publication, transmission, transfer, or exploitation of any of the content, for personal or commercial use, whether in whole or in part, without written permission from the artist is prohibited. All rights reserved. I was pleased to discover this morning that my entry in the Halloween Cat challenge in the For the Love of Cats group was the winner! / Mary is so pleased that she was chosen as the top Halloween Cat. It is her favorite holiday. Many thanks to the anonymous buyer who purchased these two prints the other day. / I’m so thrilled with the unexpected sale and I hope the buyer enjoys their purchase! I was both honored and flattered when a good friend told me that she was asking for a print of my Iris photo as her Mother’s Day gift! It is wonderful to know that she liked the photograph so much that she was asking for it for such a special occasion. It brings me great joy to think that she’ll have this hanging in her home.